Termites? Household pests? Don’t let another week go by without getting your FREE inspection. Just fill out our free pest inspection form and Frantz & Company will schedule a convenient time for your Central Illinois residential or business free pest inspection. To request a termite inspection and report for a real estate transaction, you can simply fill out our WDO Inspection Request or contact us online. 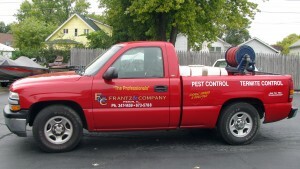 At Frantz & Company we offer a variety of pest control options such as our re-occurring preventative services. Bi-Monthly Pest Control—Maintenance Program Customer tailored to client’s wants and needs. 100% Money back guarantee. Commercial Service—Monthly Pest Control. General service tailored to clients needs and schedule. Quarterly Service—Quarterly Pest Control. One time service. One Time Service—General One Time Sprays/Services. No Money back guarantee due to onetime visit, therefore no free retreatments. The Most thorough one time service available. Inside/Out Ant Treatment—Specialized treatment for ants with guarantee. Wasps/hornets—Nest removal. One time service. Cicada Killer Wasps—First Treatment plus subsequent treatment, as new burrows are made bi-weekly till problem is solved. Rodent Control—Rodents, Rats, Mice. Includes glue boards. Mouse proofing available at an additional charge. Real Estate Inspection Plus—Buyers Advantage—along with the real estate report if and when requested we will do a general one time spray for the home before the new owner moves in. Total cost for package is dependent upon real-estate forms needed. Bed Bug Services—Prices and coverages subject to change and dependent upon situation. Asian Beetles Service—Prices and coverages subject to change and dependent upon situation. Frantz & Co, has always been professional and accommodating to our pest control issues, we have benefited from a bug free home, and knowing if we have an issue they are more then willing to come and take care of it promptly.